Harvard Law is right to stop requiring the LSAT, wrong to take the GRE. 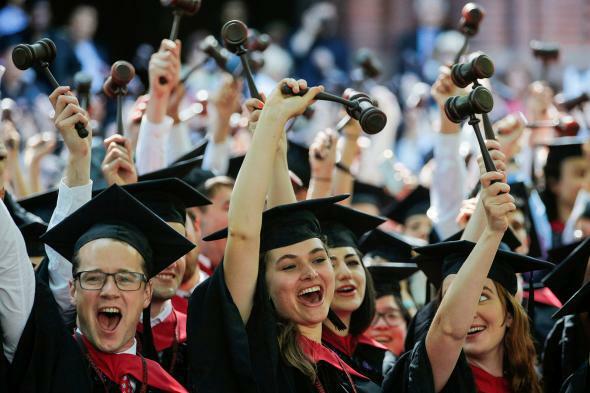 Harvard Law School students cheer as they receive their degrees in Cambridge, Massachusetts, on May 26. There are many roads to becoming a lawyer. Some wind their way around the twin peaks of poor decision-making and bad role models; others follow straight self-loathing. But all paths go through a long, winnowing tunnel known as the LSAT. The test, which accurately predicts neither law school GPA nor your chances to pass the bar, may be on its way out. Harvard Law School, the august institution that educated more Supreme Court justices than the next four schools combined, will stop requiring the LSAT for admission. Instead, a would-be Elle Woods can now take the GRE. Harvard is not the first law school to make the move; University of Arizona College of Law, among others, did so last year, but if Arizona wanted to be recognized for a smart move, it should have had the good sense to name itself Harvard, or at least Columbia. The ramifications of Harvard’s pilot program will be felt far beyond Cambridge. Law schools have been long dissatisfied with the LSAT and the testing cartel that administers it, the Law School Admission Council. As befits a group whose acronym sounds like the nickname a brotastic junior associate would give his scrotum, LSAC has acted fairly dickishly, threatening lesser law schools that dared to merely consider dropping its exceedingly arbitrary exam. As one of the few law schools whose brand and reputation so vastly outshines the capricious ranking given to it by U.S. News and World Report (in which average LSAT scores carry significant weight), Harvard can expose LSAC’s threats as idle and lead the way for many other law schools to abandon the test. At first blush, all of this seems like great news, since the LSAT is terrible at its purported purpose: demonstrating an aptitude for law. The best tests approximate the likelihood of successful future performance in a given field. Engineers stress-test metals to see how they will perform as car parts; football coaches run recruits through the combine to better estimate their ability to outrun their opponents on game day. The LSAT doesn’t do that. The LSAT tests your ability to sit in a large, stress-filled room for six hours and fill in circles with a No. 2 pencil. Study after study has shown that there’s barely any correlation between LSAT score and law school GPA (although that is somewhat to be expected, given that law schools tend to grade on strict curves: If you get a great LSAT score, you’ll probably end up at a more competitive school, which means it’ll be harder to outshine your brilliant classmates). Back when I went in law school, the conventionally wise would explain that, in fact, LSAT scores predict bar exam results. Which made sense! (At least intuitively, the exact opposite of the hardnosed, deductive reasoning our professors were trying oh so very hard to inculcate.) They are both vomit-inducing mental marathons, after all, except the bar exam lasts several days instead of just one. But recent research suggests LSAT scores aren’t even good at predicting bar results. Instead, it’s your law school GPA—which, again, the LSAT also fails at forecasting—that matters most for guessing whether you’ll pass the bar. So, good riddance, right? Actually, not quite, because Harvard has made a bad situation worse by accepting the GRE. Offered frequently and in many locations, the GRE is a more convenient test than the LSAT. Perfect. Harvard isn’t looking for a better test. It’s looking for an easier one: easier to take and easier to master. That’s the exact opposite of what law schools should be doing. It should be more difficult, not less so, to get into law school, because the last thing we need are more lawyers. That’s not a cheap dig about attorneys—some of my best friends are attorneys!—but an honest assessment of the legal job market, which is already oversaturated with law grads. The odds of finding a job go down if you get a law degree: 9.6 percent of recent law school graduates in 2015 couldn’t find jobs, while just 7.2 percent of college graduates were unemployed. Worse still, only two-thirds of law graduates managed to land positions requiring a law license, i.e., practicing law, which is the only semi-sensible reason to go to law school in the first place. The employment figures don’t improve much the further removed they get from graduation. A recent study of lawyers who passed the 2010 bar exam in Ohio showed that even four years later, just three-fourths of attorneys were using their licenses. Years of awful employment figures have driven down demand for legal education. First-year enrollments at U.S. law schools hit a four-decade low in 2014. Applications—especially from top universities—have declined. Harvard saw an 18 percent drop between 2011 and 2015 but slightly increased first-year enrollment over the same period. One simply does not permit one’s standards to slip in the Ivy League, so Harvard embarked on a hunt to goose applications. What kinds of applicants are admissions officers trying to reach with the GRE? Is it the student who lives hours away from the nearest LSAT test location? Sure, maybe. But for the most part, people who take the GRE rather than the LSAT are people who aren’t sure about law school. Too many otherwise decent human beings end up as attorneys because they didn’t have any better ideas. In order, the top 10 standard majors among law school applicants are political science, criminal justice, psychology, English, history, economics, philosophy, sociology, arts and humanities, and communications. Accepting the GRE will ultimately come back to bite law schools as their ranks fill with hesitant history majors and fickle philosophers. Rather than replacing the LSAT with the GRE, more law schools should behave like Northwestern, which strongly prefers candidates with at least one year of postundergraduate experience. That reduces the number of people who apply to law school simply to postpone the real world for another three years. Take pity on that 22-year-old who’s sitting in her college-town apartment right now, torn between pursuing a J.D. and something more valuable to society, like a Ph.D. in Sanskrit. Soon, if more schools follow Harvard’s lead (and they will), that indecisive student—with only a GRE under her belt—will be able to make the fateful, tragic last-minute decision to apply to law school.